These lovely birds, commonly found in our tropical country, can teach us humans a thing or two about love and romance! They’re regular visitors to our garden and are always sighted flying in pairs, although distancing a few feet from each other as if on a reconnaissance mission! Ever watchful and always cautious, they’ll take off at the slightest human movement, action or noise. So you can just imagine how difficult it was to capture an image of them. Their babbling is loud and is especially louder when one bird senses a meal and babbles to its mate cheerily! 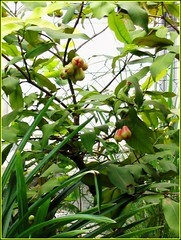 Hehe, that’s what I heard and noticed when they zeroed in to attack the juicy fruits of our Java Apple at our backyard! This last fruiting season had been dismal due to weeks of rainy depressing weather since early March, resulting in lots of fallen Wax Jambu that were about to ripen! Yikes!! 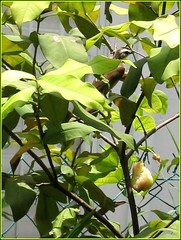 On top of that, we noticed that someone had been pinching some fruits. Initially, we thought the starlings were the culprit. We ruled out the Magpies as they prefer all sorts of kitchen scraps and bird foods instead. 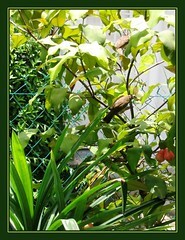 Then one morning in mid March, I saw the ‘Burung Merbah Kapur’ as are locally known in Malay, nipping at the Jambu fruits! 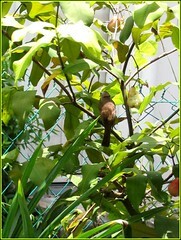 I had never known that these lovely White-browedYellow-vented Bulbul are fruit-eaters. Instantly an idea formed in my mind! God knows how I long I’ve waited to capture an image of a White-browed Yellow-vented Bulbul, so why not use these fruits as baits, I envisaged! Thus, our wax jambu tree became our bird feeder, where semi-ripened as well as ripened fruits (normally wrapped with plastic bag to obstruct the birds feeding on them) were left unwrapped on the tree just to attract these bulbuls and hope to zoom in for a capture! Weeks of monitoring went by with lots of fruits pecked and vanished, but not a single shot yet! These Pycnonotus luteolus goiavier are really elusive – they seem to know when I’m watching, but the moment I moved away, I hear their loud babbling nearby! Then I’d run hurriedly to the kitchen gate that leads to the backyard where the fruit tree is with my camera and they take flight. Humph!! Gradually, I learnt to be less hurried and excited, to creep slowly forward from the hidden angle and finally on April 9 of Easter Monday, I managed to zoom in on them feasting merrily on the remaining fruits! I was in seventh heaven, :D having resourcefully captured four decent snapshots of these elusive beauties! It was really worthwhile sacrificing all those mouth-watering Java apples after all! In giving, I’ve received my best ever Easter gift! How blessed! Praise The Lord! Habitat: Subtropical to tropical moist lowland; secondary vegetation. World Distribution: Southeast Asia from Myanmar, southern Thailand and Cambodia to Java, Borneo and the Philippines. Check Wikipedia for more information. 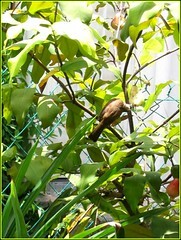 Updated 20080605: At long last, there’s a pair of Bulbuls nesting in our garden again. How wonderful!